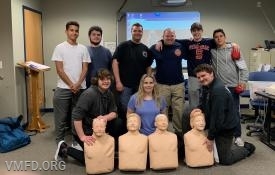 Members of The junior fire department of the Village of Mamaroneck Fire Department more commonly known as the Post 444 completed training and became certified in how to administer CPR and utilize a AED ( Automated External Defibrillator). 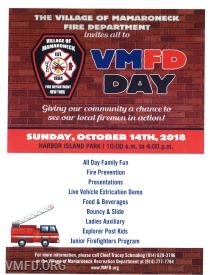 The VMFD will be out at Harbor Island Park on Sunday, October 14 from 10 am to 4 pm displaying its apparatus; providing fire prevention and other fun activities for kids; as well as presenting demonstrations of some techniques used in emergency situations. On Monday July 16th, 2018 the VMFD participated in the annual Fire Truck Hose Down at the Village of Mamaroneck Recreation Day Camp held at Harbor Island. Much to the delight of the many campers in attendance, Eng 42 operated by Ex. Captain Scott Croce responded and provided instant relief on a very hot summer day.